If you’re thinking about getting a new vinyl deck for your home, you’re making a good choice. Vinyl decks are strong, long-lasting, and beautiful. Plus, they’re perfect for expanding the usable space of your home, giving you options for outdoor entertaining, relaxation, and fun. However, there is more to installing a deck than just thinking about it. You’ll need to consider several important factors before you start your vinyl deck installation. We’ve put together a few of the top considerations you should keep in mind to save time, money, and stress. How Do You Want to Use Your Deck? No two people are alike – and neither are their decks. Planning a deck depends on how you want to use it and what its purpose will be. For instance, a deck built around a pool will be very different than a deck designed for evening entertaining or as an outdoor kitchen. When planning the kind of deck you want, think about what you would like to use it for. Your contractor can help you come up with options that fit your views. Building codes and permit requirements vary from town to town and even sometimes within different neighborhoods. Depending on the size, location, and structure of your new deck you may need to secure a building permit, HOA permission, or other documentation before you build. This is one step you definitely don’t want to skip – you could face fines or even have to remove your completed structure. Our experts at Future Outdoors can help you plan ahead and secure the permits you need. Where Will You Build Your Deck? Where should your deck be located? Do you want to use it to watch the sunset, or enjoy a particular area of your yard? Do you want to provide secondary access to your deck, such as a side yard? Where would a deck fit best from an architectural or design point of view? 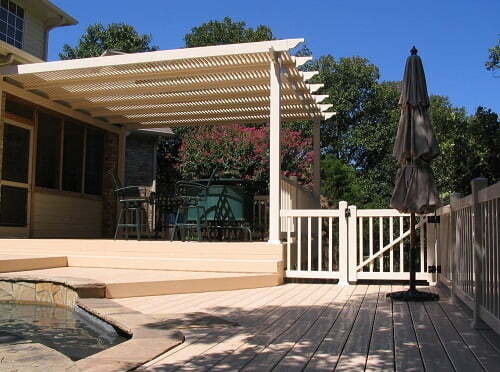 Do you want to place a vinyl shade structure such as a pergola on your deck? Considering these questions can help you decide what you value most in your deck. Of course you may also be constrained by your home’s shape, the contour of your property, or other features in your yard (like a pool or large trees). This is why it’s also important to work with a great contractor who can help you solve these issues. Will You Need to Landscape? Decks require a few things, the most important of which is support. Almost every deck is held up by posts dug into the ground or by connections to your house. However, digging can also raise drainage and leveling issues in your yard. If you’re planning to place your deck in a certain spot, make sure you talk with your contractor about these complications first. They might be able to spot potential problems you overlooked and help you avoid a huge headache. Cost considerations aren’t fun, but they are important. You need to know what your budget is for your deck project before you plan so you can get an idea of what is possible. Make sure you discuss this with your contractor so they can give you ideas on how to achieve your goals with the budget you have. You might also be tempted to skimp on one of the most important parts of a vinyl deck build – the material itself. However, a quality vinyl deck pays for itself in ways that cheaper vinyl and wood decks don’t. With a high-quality vinyl deck you may pay more initially, but you won’t have to worry about painting, staining, sealing, or repairing your deck year after year. Over time, vinyl decks cost much less and last much longer than wood. At Future Outdoors, we can help you get the best vinyl deck possible for a great price. Our vinyl decks are made from the highest quality vinyl, ensuring they last for decades without fading, staining, or wearing down. Call 972-576-1600 today to learn more about the vinyl deck options we have available, or follow us on Facebook for more tips and ideas about vinyl decking, fencing, shade structures and more.